A sense of self is an essential part of our human experience. We all have an intuitive appreciation of our self when we look at our reflection in the mirror, recall a memorable event from our childhood, or consciously turn our attention inward to think about ourselves. While it may be difficult to imagine what it would be like to lose our sense of self, there are several psychiatric and neurological conditions associated with severe and debilitating alterations in self. Some examples include heightened negative self-related thought in major depression, the loss of self-insight in schizophrenia, or the progressive deterioration of autobiographical memory in Alzheimer’s disease. The overall goal of our research is to understand the brain systems underlying self-related processes, in both the healthy and dysfunctional brain (e.g., psychiatric illness). 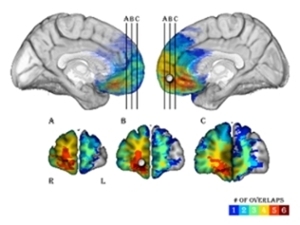 We use fMRI, psychophysiology, and a variety of behavioral paradigms to study different types of self-related processing—such as self-reflection and self-agency—with healthy subjects and psychiatric patient populations. Specifically, our current research interests include: (1) examining dimensional relationships among self-related processing, psychopathology, and resting-state brain activity, (2) developing and validating performance-based assessments of self-related processing in healthy populations, and (3) using self-related processing tasks to predict treatment response in psychiatric patient populations. Philippi et al., 2012. Journal of Cognitive Neuroscience. 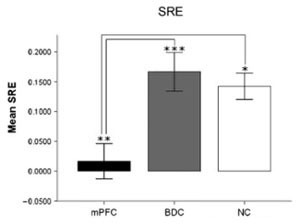 Study shows that damage to the mPFC abolishes the self-reference effect in memory. Philippi et al., 2015. Journal of Neuroscience. 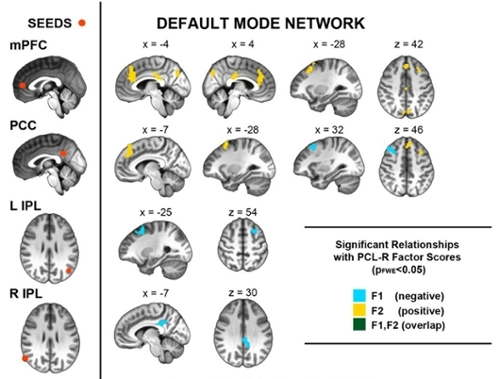 Study shows reduced DMN connectivity associated with interpersonal/affective traits of psychopathy (Factor 1), but enhanced DMN connectivity associated with lifestyle/antisocial traits of psychopathy (Factor 2).